Ken Griffey Jr. came into professional baseball with a hype largely unmatched by any player before or since. It did not take long for people to realize the value that surrounded "The Kid" and many rushed to capitalize by producing cards of the young phenom. As a result, there are quite a few Ken Griffey Jr. minor league and pre-rookie cards to track down. 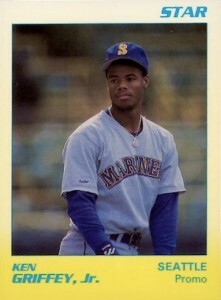 Shop for Ken Griffey Jr. Minor League Cards on eBay. The following list documents the main Ken Griffey Jr. cards that came before his official MLB debut. 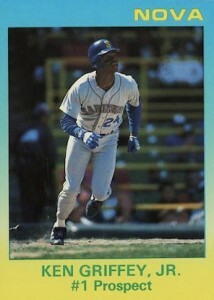 To keep things simple, the cards are capped at 1988, due to his official rookie cards coming in 1989. Most of the cards listed below have print runs in the 10,000 to 15,000 card range, but lower numbers are noted when known. 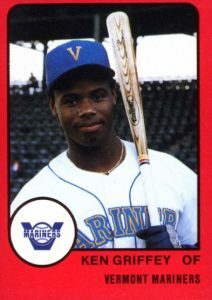 While there are several Ken Griffey Jr. minor league and other pre-rookie cards available to collectors, unlicensed cards flooded the market and remain plentiful today. We highlight a few of the more commonly found unlicensed options at the bottom of the article as a courtesy to collectors. This card uses the same basic format that is featured on almost all of the cards listed here. Defined border, large color image and limited text makes for a very simple card. As the first official Ken Griffey Jr. minor league card, it remains a popular option for collectors, especially in graded form. The cards were originally issued by the team as part of a 33-card factory set. There is also a team card (#33) that doubles as the checklist. 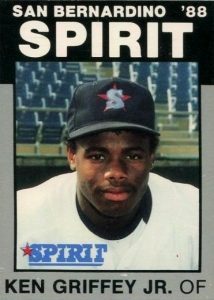 Ken Griffey's 1988 San Bernardino Spirit minor league card from Best Cards is among his most valuable early collectibles. The bright blue, close-up image and large text helps distinguish it from other early releases. There is also a Platinum parallel (gray) which is shown below on the right. While neither card is numbered, it is believed that the base version is limited to 5,000 cards and the Platinum parallel is limited to only 1,300 cards. 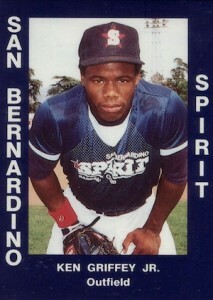 Arguably the most generic of the bunch, the 1988 Cal League San Bernardino Spirit card for Ken Griffey Jr. is not going to win any design contests. The hunched pose of Griffey and large border do not make for the most visually appealing option. It also doesn't help that Griffey looks like he is very unhappy with something. He has a similar unlicensed version with a virtually identical back. 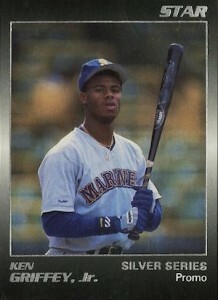 The key difference in spotting the authentic card is the image of Griffey. 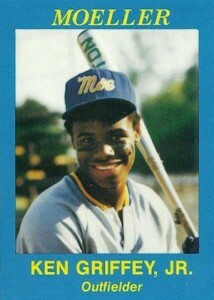 Evoking more of the late-80s feel, this card recognizes Ken Griffey Jr. as a minor league All-Star. 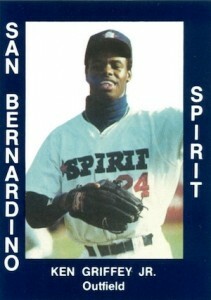 Although he played with three minor league teams, the Spirit are the main focus of his early cards. 1988 ProCards Vermont Mariners Ken Griffey Jr.
With a vivid red border, 1988 ProCards showcases Ken Griffey Jr. on his last stop before Seattle. This Vermont Mariners card is his final official minor league card. While Star cards are not actually minor league cards, they are licensed. Several options are available, but the 1988 Silver Series is among the most valuable. The set includes nine different cards that each feature a different title. Themes include Father/Son, The Future and #1 Prospect. It is believed there are 2,000 total sets. Also, a black-bordered promo card exists that is listed as one of 400 on the back. Following the same format as the Silver Series, there are nine consecutive Ken Griffey Nova cards, each with a different title. Again, a promo card adds to the total. 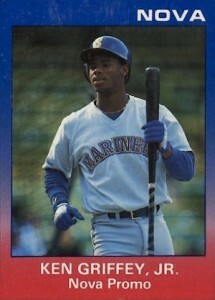 1988/1989 Star Promos Ken Griffey Jr. These are a little tricky since they have blank backs, but the promos below are usually attributed to either 1988 or 1989. 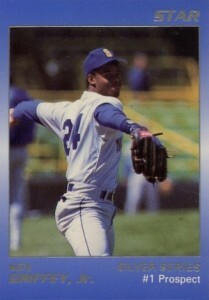 If it was not already clear, Star loved to make promo cards and Griffey was a popular athlete to include in a promotional capacity. Unlicensed cards can be an interesting alternative for collectors and can be obtained for just a few dollars in many instances. The problem arises when knockoff cards are presented as official and unknowing collectors are taken for a ride. When dealing with early Ken Griffey Jr. cards, one key thing to look for is graded copies from reputable grading services. Chances are good that if you cannot find a graded version, it is likely a knockoff. Also, there are instances where signed versions have been authenticated by PSA/DNA. It is important to realize that PSA is only authenticating the signature, so some unlicensed cards have certified authentic signatures. While there are multiple unlicensed Ken Griffey Jr. minor league cards, a few seem more common than others. Again, there is nothing wrong with collecting the cards, it's just always good to know what you are buying. 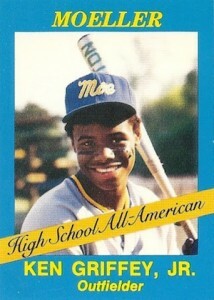 1987 Moeller High School Ken Griffey Jr.
One of the earliest Ken Griffey Jr. cards, the 1987 Moeller High School card shows a very young Griffey in high school. The card is credited to AAMER SPORT, who was also the manufacturer for several oddball Michael Jordan golf, baseball and basketball cards. 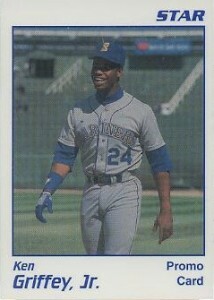 There are two versions of the Griffey card. Following the exact same layout and color scheme as the California League card listed above, this card has likely confused many collectors. If you look at the complete set, all players are shown in their dark jerseys, including the authentic Griffey card. This one obviously features him in a white jersey. Titled Griffey time. san Bernardino spirit. 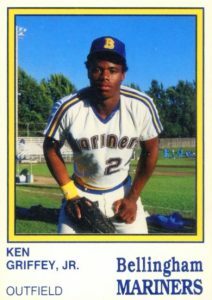 In regard to the 1988 Best San Bernardino Spirit Ken Griffey Jr. #1 card, you state that neither card is numbered, yet every place I have looked (including your title) says these are numbered #1. Do these cards have a number one on the back or not? Thanks! John Guarneri � The San Bernardino Spirit Ken Griffey is not serial numbered. That was what I was referring to, not the card number. Sorry if that was not clear. The card is indeed #1. I have a certified autographed ken Griffey jr Classic Best card. any value? 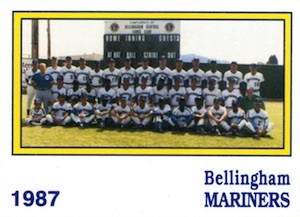 Pretty sure that I can prove to you that someone made a fake 1988 Cal League San Bernardino Spirit Ken Griffey Jr. #34 with Griffey in the hunched pose. 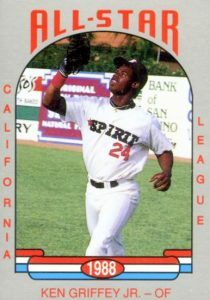 My father, Kent Bowersox, was the photographer for the 1988 Cal League San Bernardino Spirit #34 AND the Cal League All-Star #26 cards, both featuring Ken Griffey Jr.
By no stretch do I take offense to the claim that it’s the “most generic of the bunch” or..that it “is not going to win any design contests”….that…God rest my fathers soul…couldn’t be closer to the truth. I do have to take issue, however, with the inclusion of the “white jersey” card # 34 in your list of Griffey Spirit cards. This is, and has…for many years…be known and recognized as a counterfeit version of the California League Set. This card was never authorized by the California League, Joe Gagliardi (President of the California League at the time) or any authorized representative of the Mariners organization. If you have any questions, or wish me to prove my knowledge regarding this matter, please don’t hesitate to contact me. I have a ken Griffey jr 1992 extremely limited Classic best minor league autographed card that is 370 out of 2100 with a circled hologram in the left corner , was wondering if you have ever seen one?? This guide covers the minor league cards that pre-date his 1989 MLB rookie cards. I’ve seen the Classic autographs numbered to 3,100. 1988 PSA 8 KEN GRIFFEY JR STAR SILVER SERIES PROMO ONLY 8 GRADED HIGHER! !